Select a conference bridge by configuring your own conference bridges in AlertOps. Add a bridge to your alerts. The bridge can be auto dialed from a voice notification by pressing 0. Users can connect to a bridge by click the phone number link in an email, either from a smart phone or a computer. Click Administration in the menu bar. Then, click Bridges. Select a Priority level from the drop-down menu. Enter a Telephone Number (complete with country code). Enter a Telephone Access Code. This is the passcode to access the bridge. Enter a Telephone Message Body. This will be the message read to the user by voice notification. You can send bridge telephone number and access code through an email API Inbound Integration. Useful for Setting up ticketing system integrations. Configure an Email API to accept a bridge telephone number and access code, useful for ticketing system integrations. 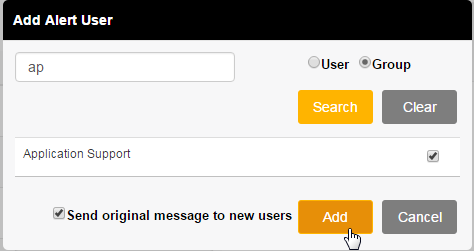 You can also assign the alert user or group recipients through the Email API. Select the bridge when creating a manual alert. You can add Users and Groups to a call already in progress. Go to Find Alerts and select the Alert. From the Alert Detail click the Add others to this alert button. From the Add Alert User add either Groups or Users to the alert. Each user will be alerted using the same escalation rule that was used in the original page.